Football season is upon us! My husband is in heaven, and I’m looking forward to all the good party food! Let’s be honest, the party food is the BEST part of Football season, right?! Well, I’ve got an easy to make recipe that is sure to kick off your football party on a tasty note. 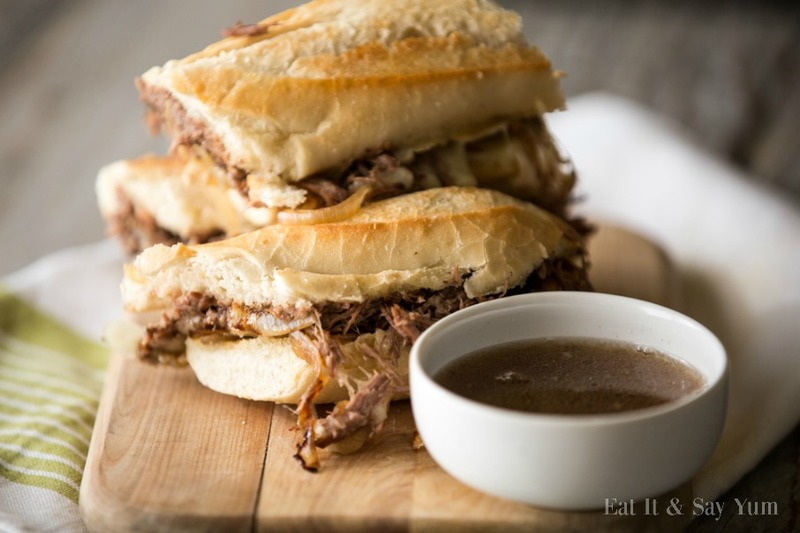 These Roast Beef Sandwiches are SO delicious, and easy to make. You cook the roast beef in your slow cooker until it is nice and tender and just shreds with a couple forks. And I only add three ingredients to the meat! THREE! How easy is that?! I like to use a couple baguettes to make these sandwiches. They are long like a sub sandwich, which makes them easy to cut to the length you want and feed any size appetite. For great texture, I use a baguette that is a bit on the crunchy side. I cut it open, butter the insides and toast it under the broiler. Then top one side with the shredded meat, sliced provolone cheese, and caramelized onions. Did I not mention those caramelized onions before? Well let me tell you how amazing they are! 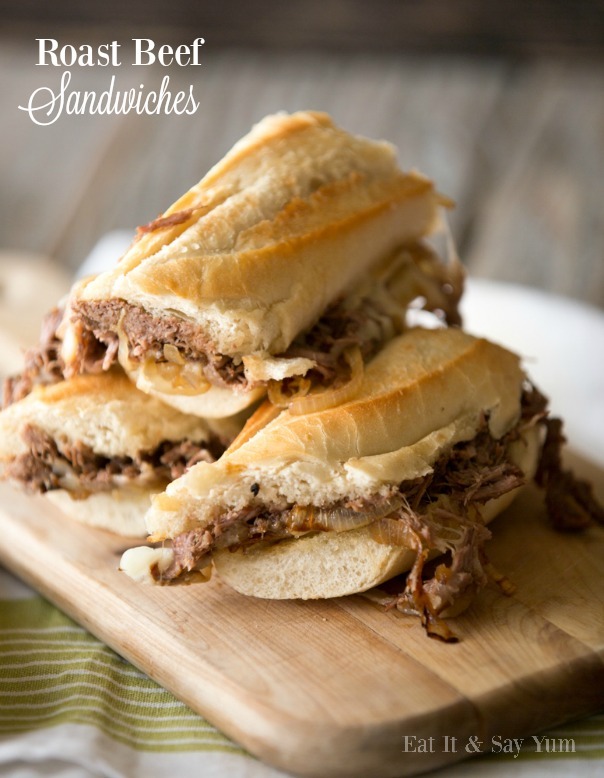 They have so much flavor and are soft, and the perfect addition to this sandwich. I also like to use the meat juices that are left in the slow cooker as a jus. Dipping the sandwich in there before each bite is super delicious. I did say these are perfect for game day, but they make a great meal any night of the week. Once you see for yourself how delicious and easy they are you will be adding them to your weekly menu. No joke. Place your chuck roast in a slow cooker, sprinkle the dry onion soup mix over the roast. Pour the cup of water around the roast, and add the Worcestershire sauce. Cover with the lid and cook about 4 hours on high, or 8 hours on low. When meat is tender, after cooking time, shred the meat with two forks. Let the meat sit in the slow cooker, with the meat juices until ready to use. In a large pan or skillet add the olive oil and sliced onions. Let them cook over medium heat for about 20-30 minutes, stirring frequently- allowing the onions to turn brown and caramelize. Remove from heat when they are ready. Slice the baguettes open and butter the insides. Toast the baguettes under the broiler until they are golden brown. 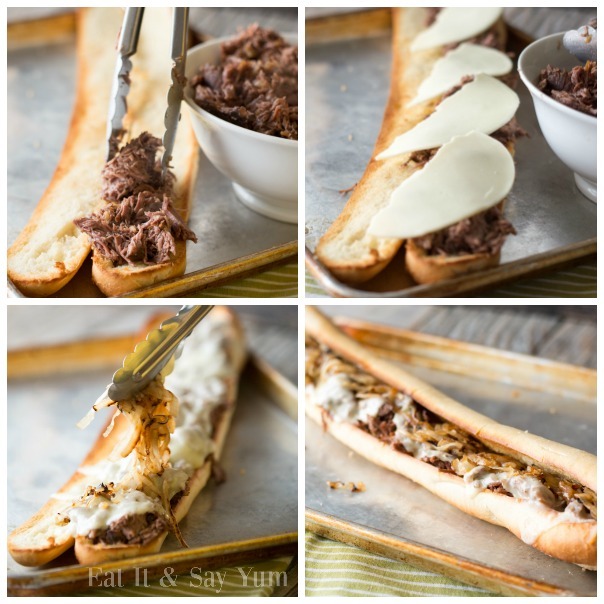 Top one side of the baguette with the shredded meat, top that with the slices of provolone cheese and place under the broiler again to melt the cheese. Top the melted cheese with the caramelized onions, then close the sandwich and cut to your desired sizes. Find more delicious recipes at Eat It & Say Yum!